I am a member of the Collective Bias® Social Fabric® Community. This shop has been compensated as part of a social shopper amplification for Collective Bias and its advertiser. All opinions are honest and are my own. Come on- you know these hot pants aren’t going to finance themselves. We’re not exactly sports people. Don’t get me wrong, we’re active, but with all the other activities we have going on, sports get pushed by the wayside, along with video games and hot dog eating contests. It’s not killing us. Where’s my weakness? Football food. The real travesty here is that football watching, one of nature’s most exerting activities, almost as physically stressful as the game itself, is party to a delicious combination of flavors– the lauded buffalo, the ever-reliable trope of things deep-fried in sandwich form, various iterations of cream cheese and graham crackers, and an inexplicable need to slather beer on everything and pretend it still tastes decent. So, I vex myself trying to justify the consumption and inevitable transition to a diet comprised of 80% dip. Is it still football food if you’re not watching football? Furthermore, is it still football food if you’re not watching anything? 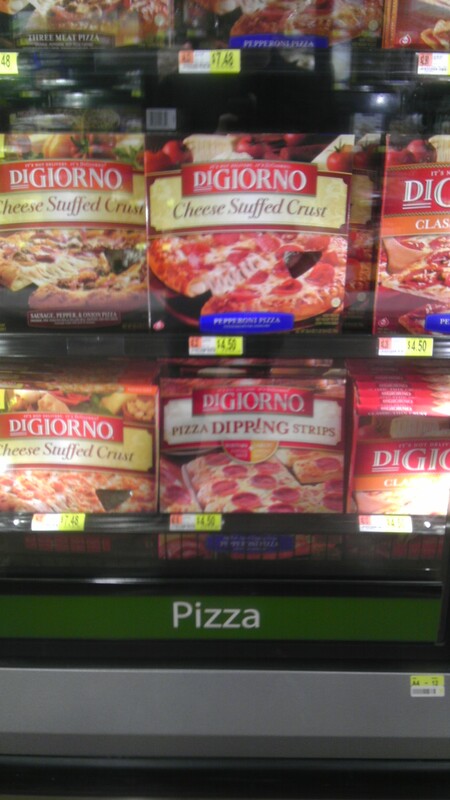 I’ve extrapolated on the mayonnaise-laced semiotics of the phrase in my lengthier dissertation, “Hut (Pizza): The Absent Crust,” (alternatively titled “Of Grahamatology”) but wanted to welcome you in to my studies with a light-hearted recipe, using DiGiorno Pizza and a healthy suspension of disbelief. Here’s an appetizer that will fit in at any casual cocktail party as it will the big game. I craved something fresh, but also handheld, and also incorporating pizza. 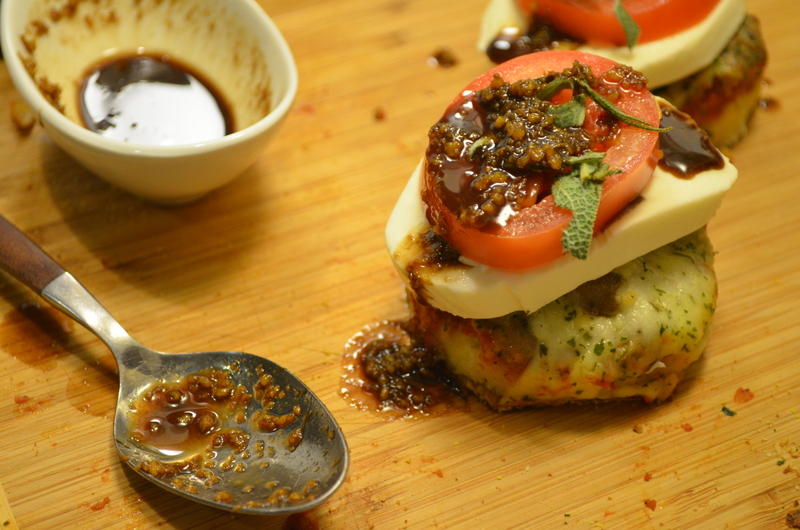 Thus, the sage caprese crostini were created, with a tangy balsamic-orange glaze to offset the richer flavors of the meat. 1. Preheat the oven to 375 degrees. In a small pot on medium heat, start simmering the balsamic vinegar and orange juice. 2. Cook the pizzas according to the manufacturer’s instructions. 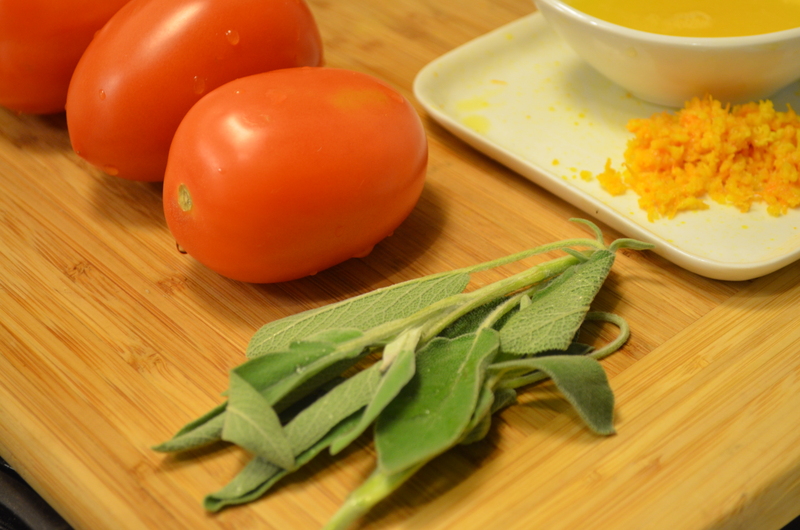 When done, cool for ten minutes and prepare the cheese, tomatoes, and sage. 3. When the vinegar has reduced to about 3/4 of its original volume, add the orange zest and honey. 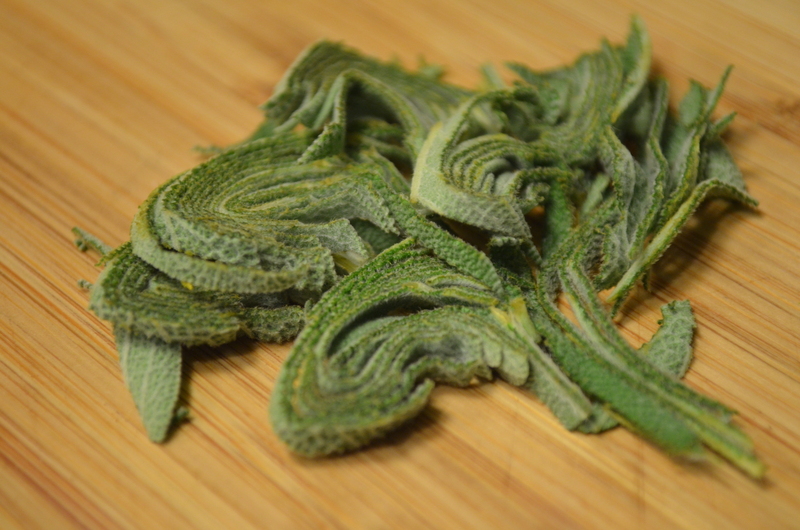 Simmer on low until you’re ready to serve the crostini. 4. Cut the crusts off the pizza- you may discard them at this point, or serve them as breadsticks. 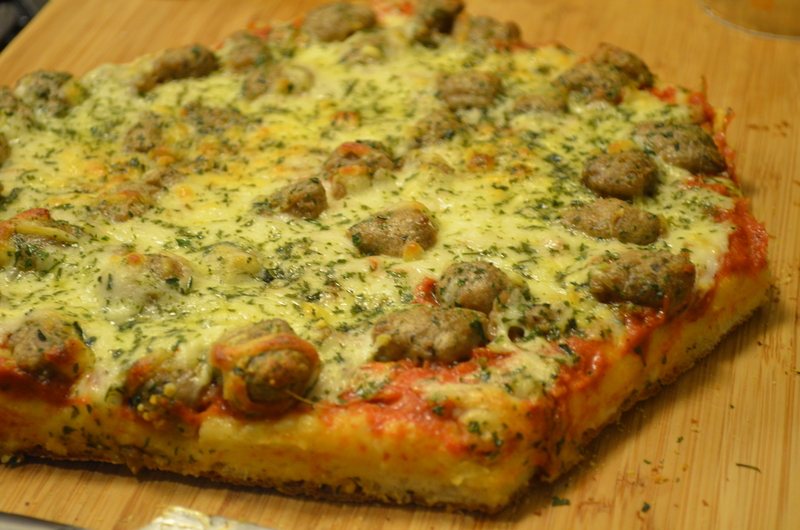 Using a cookie cutter or a glass, carefully cut out circles of the cooled pizza. 5. 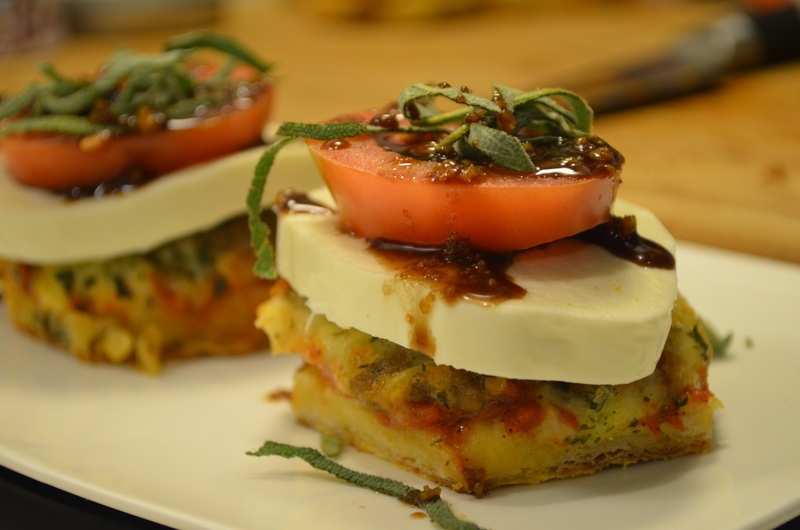 Assemble the crostini by placing a slice of mozzarella atop the pizza, followed by tomato, and a sprinkling of sage. 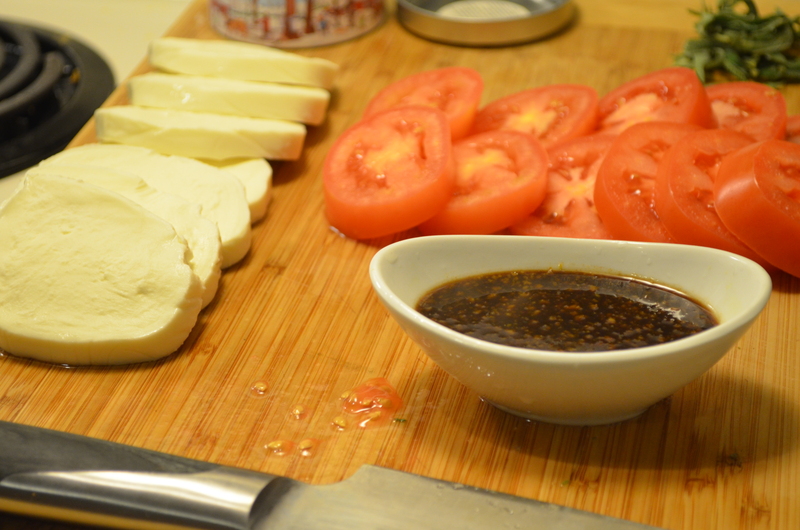 Serve with a spoonful of balsamic sauce on top. Devour. Jess, Jess, Jess… we are going to make a baller out of you yet. Real American football food ain’t no tailgate fare unless by tailgate you mean some entirely carnivorous rear entry position. Real football food is 3 yards and a cloud of dust and a clump of grass. Get your cleats on. See you at midfield for a double-hitch post pattern. catch you in the end zone. Tailgating makes me wax nostalgic for my OkCupid days.